Horseproperties.net is a unique website created for the horse enthusiast. We offer the discriminating buyer a place to view and compare US and international properties especially suited to accommodate horses, and of course, their owners. We understand that horse property specific information just isn’t easily available on a typical real-estate site. That’s why HorseProperties.Net was created: to provide a visually appealing and informative resource to make your search for the perfect horse property an enjoyable experience. Launched in 2005, we are now the world largest website dedicated to equestrian estates and horse farms. The information you seek can be found easily…just click on any of the properties advertised and you will have instant access to beautiful photos and horse property specific information, such as acreage, barns and outbuildings, training facilities, riding arenas, etc. HorseProperties.Net is the premier destination for horse properties. 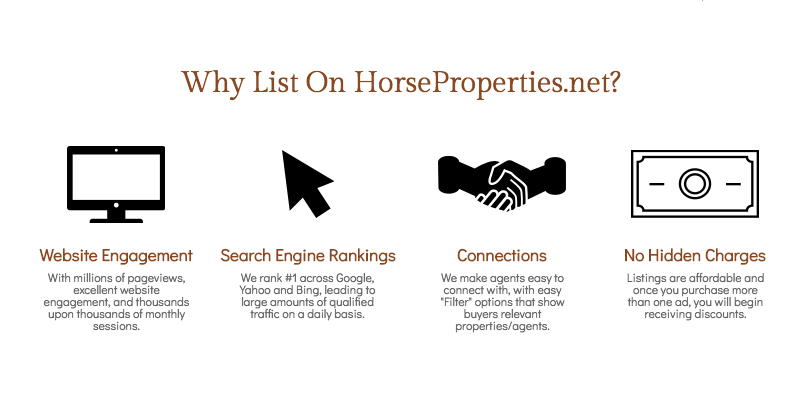 With millions of page views, excellent website engagement, and thousands upon thousands of monthly sessions, you can be assured that those coming to HorseProperties.Net are actively searching for equestrian real estate. We Rank #1 on Google, Yahoo, and Bing searches, resulting in tremendous traffic on our website. We focus on ranking in local markets as well, and thus, having your properties listed on HorseProperties.net means exposure to interested buyers both in your area and around the world! HorseProperties.net has 287% more monthly clicks than our next competitor. HorseProperties.net has 38% more search keywords than our next competitor. HorseProperties.net has 32% more page one keywords than our next competitor. Our website connects buyers with sellers. We make agents easy to connect with, with an easy "Filter" option that will connect buyers with skilled agents. We have a special discount for multiple listings: 5% off for two ads, 10% off for 3 ads, 15% off for 4 ads, and 20% off for 5 ads. And, you can replace your listing with another one as soon as you've sold it. There is no automatic renewal, no sign-up fee, no cancellation fee -- no hidden charges. Just a one-time payment. 2. Click LOGIN if you have an account, Click REGISTER, if you don't. You will be redirected to the payment page to purchase the advertising space. 3. Create your ad and then post it. A complete web page for your listing – with unlimited text and up to 30 photos at no extra charge – and no other agent will advertise on behalf of your property. A weekly newsletter will be sent to over 70,000 people in the equestrian or real estate industry, showcasing our newest properties by state, and including your ad. If you are a licensed real estate agent, you will be listed on our page for qualified agents. A paper certificate will be mailed to you. The certificate is for you to present directly to the seller. It's another way for you to show your client your excellent work on their behalf. We have had a great response from agents who sent out the certificates…their clients were thrilled to see the global Internet exposure that their property was receiving. Simply Sign In by clicking "Agent/Seller Sign-In" in the upper right-hand corner. If you have any questions during this process, please feel free to contact us. Happy selling!